Every time you go fishing you become an ambassador for our sport. Your actions on the beach especially, but also on the boat, govern how the public judge us. The most critical factor is our handling of fish. Most anglers realise also, that it's in our own best interests to preserve that part of the catch that we cannot, or do not want to keep for eating. It may be a small contribution to the overall fish stocks, but nevertheless it is a worthwhile contribution and does not add to further depletion. We look here, at the best way to handle and conserve the fish we catch, and how to return them safely to the water. TO GAFF, NET, OR LIFT? There is a case for using a gaff on massive boat conger and 20lb plus shore eels. But this needs to be done by somebody who understands the need to place that gaff in the underside of the eels jaw where there is soft membrane and little else. A small neat hole here does no harm. Those of you who think such precision is impossible should take a trip out with Newhaven's Terry Lee (Sea Breeze 3) or Glyn Lloyd from Cardiff. Gaffing the conger in the body, as in the old days, is unacceptable now to most anglers and also to those skippers that want to remain respected in angling circles. Giant skate will also need to be nicked with a gaff in the leading edge of the wing, but again, a neat hole here does no harm and is less of a wound than most that occur naturally on the seabed as fish make their living. Treated like this, the conger and skate can return to their home fit and healthy to fight another day. Stingray and monkfish may need to be gaffed too. Tagged fish, initially gaffed aboard, returned, and then re-caught are the best evidence that careful gaffing does no harm. That's where the need to gaff ends. Surely sharks will have to be gaffed? No way! Small sharks can be lifted by two men easily enough. One grabs the dorsal and the other the tail and gently lifts the shark aboard for unhooking, then return. Bigger shark are left in the water and the trace cut near the hook. Any regular shark angler knows the numbers of shark swimming around quite happily with long-liners hooks in their jaws. The difference is angling hooks should be bronzed patterns that are quickly shed by the shark, whereas long line hooks have a coated finish that resists corrosion. Potential record shark to be brought home need only be tailed with a strong rope tailer and then lifted aboard when ready via the tail and dorsal. Besides, tailing is a more secure way to handle big fish, because when gaffing, a simple twist of their powerful body is enough to free them from the gaff. Archaic mid body gaffing procedures are unacceptable in modern behaviour and photography anyway. Some skippers, like Dave Taylor, who runs "Aldebran" out of Aberystwyth actually "nets" porbeagles up to 90lbs in a massive, purpose built landing net. Once in the net, the netting gives a good grip and spreads the sharks weight. This illustrates the ease with which cod of 40lbs, pollack over 20lbs, ling etc, can be landed. And without that inevitable risk of loss when using the gaff. Tope can also be secured by grabbing the tail and dorsal and lifting them aboard. Done like this, the body stays supported and you get a good grip. Also, by holding the dorsal you have the tope held in mid body which stops it twisting round and trying to bite you. Huss should be grabbed by the tail and hook trace and lifted, and thornbacks and other rays the same, though use a gloved hand to grab the tail on these. The priority when landing both boat and shore fish is make sure that they cannot thrash around and injure themselves. You'll find all fish become subdued if you cover their eyes with a damp cloth. Fish have a protective coating of mucus or slime on the body that is a safeguard from infection, and by handling the fish with a damp cloth or wet hands, this slimy coating is left intact. Handle a fish with normal dry hands and some of that coating will adhere to the hands and leave the fish open to attack. Some thinking shore anglers have taken to using a large piece of chamois leather, or a coarse fisher's pike\carp bag to lay the fish on whilst the hook is freed. This does less damage than laying the fish down on the sand or shingle. To see some anglers perform when actually handling a fish makes you wonder why their fishing in the first place, such is their fear of fish. A confident, but gentle grip is essential for clean unhooking. Round fish should be gripped between thumb and fingers over the head and just to the rear of the gill plates. This allows the hand gripping the fish full manoeuvrability. Dogfish, having that habit of twisting their abrasive tail around your arm, should be held by folding the tail round to touch their head and gripped so for unhooking. Silver eels, there is no easy way, but use a piece of damp chamois leather to grip the main body and gently grip the head between index, middle finger and third finger. The best tool for all hook removal in smaller species is a pair of quality long nosed pliers. Use these every time, because they're far quicker than your fingers for anything other than a light lip hook hold. For tope, shark, rays etc, a long handled pair of normal pliers are good and keep the hands away from any teeth. The best place to grip a hook is not on the shank, but in the middle of the bend where gentle, but persistent pressure away from the hook hold will lift the hook point free. Twisting the hook does no good at all. If a fish has pulled the hook point fully through the lip, then it's quicker to snip the hook trace off above the hook, and pull the hook through point first followed by the shank. If a flatfish has got a hook down deep, then it's best to cut the hook off at the knot and free the fish with the hook still in. Consider that flatfish, in fact all fish, will eat broken mussel and razorfish shells and hard backed crab with ease, and you realise just how insignificant a hook is to a fish. Evidence suggests that fish can shed a hook within hours anyway, providing it is a bronze pattern and will corrode. Coated or commercially plated pattern hooks and stainless steel hooks should never be used. A few inconsiderate anglers persist in throwing unwanted fish back into the water. Some fish like, pout, poor cod, whiting etc, can be damaged this way. The correct method is to walk into water at least a foot deep and preferably beyond the surf if possible, support the fish in the open palms of the hand along the belly and tail facing into the oncoming water, and simply hold it there until it swims away. It takes only a few seconds before the fish readjusts itself and is gone. 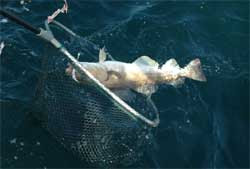 Watch out for dogfish which have a habit of swimming back inwards towards you after release. If you walk them out into deeper water this will not occur. Likewise pout! Rock marks often sees the angler many feet from the water and returning fish like wrasse and pollack needs a different approach. Here, you use any available rock pools that are deep enough and near the low water line to leave the fish in until the flooding tide frees them. They come to no harm and even big fish like huss and conger will stay dormant and patient until the tide arrives. The boat is the same. Dropping a fish overboard should be avoided. Hold the fish by the tail and pectoral or dorsal fin in the case of tope, smoothounds and the like, or with the open palm supporting the belly with round fish, and just lower it into the water and hold it until it voluntarily swims away of it's own free will. The head should again point into the oncoming tide, ie, towards the bow. This applies to small fish like whiting too, that need to be placed in the water on return, not dropped! If you want to retain fish alive for photographs or weighing, then place them in rock pools, or in a 5 gallon plastic bucket that has fresh sea water changed frequently. Mustad have introduced a barbless hook based on the Viking pattern but redesigned for tope and ray fishing. This hook, numbered 79514, is being used for all manner of fish now including blue sharks, huss, smoothounds and small conger eels. When fishing purely for fun, such as when tope fishing, breaming, after rays, or when dogfish are being caught in numbers, if you're using a standard barbed hook, pinch the barbs on your hooks flat. You'll find you lose very few fish but unhooking them is easy. If you lay an eel on the beach prior to unhooking it will roll up into a slimy ball, but if you hold the hook trace and lift the eel into mid air it will unroll itself and fall straight for ease of handling.